What do we need to learn about complex systems? We need to learn how to work in the ‘collaborative’ quadrant, which in turn involves us in having to model structure-determining processes as well as the familiar structure-determined processes. This is not easy, because it implicates us as modellers – even as systems developers constrained to satisfying a user’s requirement, we are structure-determining in the way we do our work. How are we to give an account of the dynamic effects of those with power over what happens? 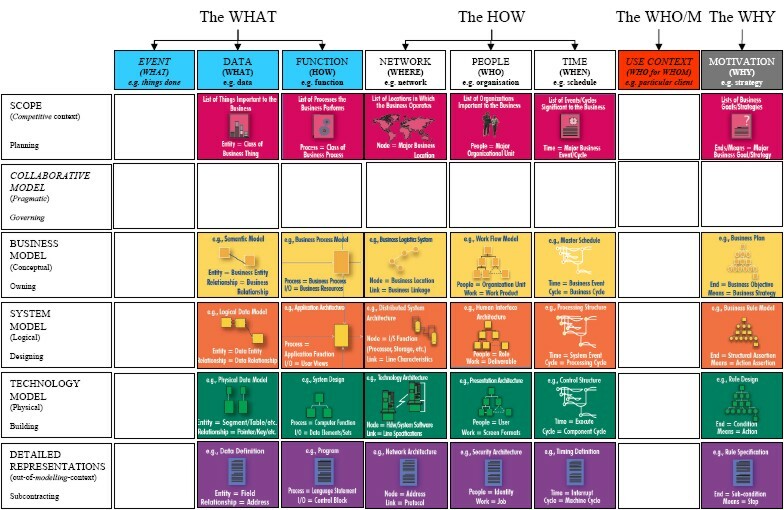 These “models” are models populating the different squares of the Architecture Framework, the underlying presumption being that the work of the Enterprise as a whole must be to ensure the on-going coherence of its Architecture. Why? Because the presumption is that the behaviour of the Enterprise can be structure-determined by this Architecture. But the question I want to address in this blog is what happens to that framework if we need to assume an asymmetric relation to demand. The additional row introduces the collaborative model through which different architectures are brought into relation with each other. And the two additional columns introduce on the left the models of events of which the data column is itself a representation, and on the right the contexts-of-use in relation to which behaviours are generated. We see now across the top the four ‘colours’ needed to give an account of taking power to the edge. The addition of the ‘red’ WHO/M column situates the relation to demand (see more on this here), and the ‘black’ WHY column is now assumed to include asymmetric assumptions about the bases of competitive advantage. So what does this tell us about modelling structure-determining processes? 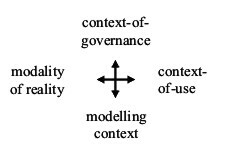 The ‘South’ direction is unchanged, concerning itself with the detailed method of modelling, but the ‘North’ direction is generalised from the governance of the particular Enterprise to the context-of-governance emerging from collaboration between Enterprises. The ‘West’ direction is largely unchanged too, the addition of models of the events emphasising the particular modality of reality within which the models are being built (i.e. what are the forms of knowledge that we are interested in modelling). The greatest change is the ‘East’ direction, which now emphasises the asymmetric nature of the contexts-of-use in relation to which the collaborative behaviours are being constituted. What does this tell us? In modelling structure-determined processes, we can take the ‘North-South’ axis as a given, and elaborate the ‘East-West’ axis within its terms. But in structure-determining processes, we have to start with the particular ‘East-West’ relations to context-of-use, and then examine the ways in which they are supported and/or restricted by the ‘North-South’ axis: in responding to asymmetric forms of demand, governance shifts from being an a priori to being an a posteriori consequence of the way we want to be able to respond to the particular demand. This is the challenge of taking governance to the edge.